Maggi Kerr Peirce, having performed during the American Folk Music Revival of the 1960s and 1970s with the likes of Pete Seeger and Peter, Paul & Mary on stages from the Newport Folk Festival to events in Puget Sound, expected interest in her musical career, but exclaimed “Nobody ever asked me about my childhood stories.” Once asked, she delighted in filling willing ears with tales of her father the constable, her mother the baker, rowdy boy cousins, and the memorable visit of an American cousin. Back in his spare publishing office, the indie publisher boxed up a used office computer and mailed it to Perce in time for Christmas 2011. “You really want me to write this,” Peirce exclaimed, thanking the publisher for replacing an older computer, which in turn had been the gift of Steve Sanfield, a California storyteller. And so A Belfast Girl, a memoir of Maggie Kerr Peirce’s early years in Belfast was conceived. 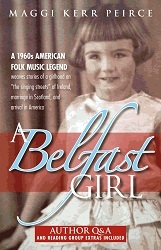 After two years of writing, editing, photo searches aided by Peirce’s daughter, Cora, book-designing and planning will now result in the publication of Mrs. Peirce’s “wee book” to the delight of readers of all ages, especially those who admire old Irish culture or remember the American folk music revival fondly. Visiting the modest home of Maggi Kerr Peirce in Fairhaven, Massachusetts, one can easily believe she has been transported in time. In the kitchen, a Tupperware container looks positively futuristic among the prevalent enamel ware. In the dining room stands a sideboard far more substantial than those shipped these days from China or Indonesia. The sideboard there is covered by a crochet doily laden with Depression glass. But the oldest things in the house are the ancient folksongs Maggi learned from her mother and her aunts as a child growing up in a working class neighborhood of Belfast. Maggi Kerr Peirce is thrilled that her “wee book” will make its appearance in bookstores and libraries this November. She will be in good company as readers of A Belfast Girl laugh at her childhood pranks, identify with her teenage insecurities, and remember a kind relative who did not return from the war. of her native song culture from Belfast to the American folk music revival of the late Twentieth Century.